The new iPhone has already hit the stores. This time Apple has come out with some killer features that make it stand out of the Android phones league. The A7 chip makes the iPhone 5S the world's first 64-bit phone. The 5S comes with the new M7 coprocessor which aims to put less strain on the battery life. The iOS 7 operating system is very new and has new design and features. 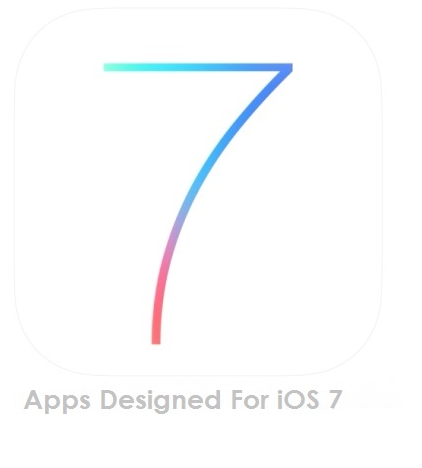 App developers are busy bringing Apps that run on new iOS 7 OS. So, whether you have bought the new iPhone 5S or 5C and are among the people who have bought a new iPhone, or you have just updated your old iPhone, you would definitely like to try some new apps that run on iOS7, wouldn't you? This 3D fantasy-battle game offers you fight your way through a mystical world, slashing with a sword controlled by finger swipes. The game takes full advantage of the 64-bit A7 processor of the 5S and its graphics are its most impressive features. The game is exciting as there are different powers, weapons, fighting styles, 2 playable characters & 8 new worlds. It is one of the first iPhone apps to support the new M7 Motion coprocessor packed in the iPhone 5S, which uses less battery and allows the app track your run & rides more accurately. Now, the app will stop GPS tracking for measuring the accelerometer, gyroscope and compass on the iPhone 5S, when you are not moving, waiting at traffic or trying to take a breather. The app has two version, a free and a premium. Though, Apple has worked on the iPhone 5s' camera performance in low-light photography, and has added a burst mode that automatically chooses the sharpest shot, but there's always room for improvement. For adding special effects like filters, download Aviary's Photo Editor app. The app let you tweak photos and comes with powerful effects, like blurring of images or adjusting their contrast. Another great app is, Camera+. It is one of the best camera apps available on the App Store. The app's interface has been improved to align with iOS 7's. The app comes with clear navigation panels & flatter look. Camera+ offers you to use Airdrop to send photos to other Wi-Fi supported devices with ease & to send photos wirelessly to an AirPrint supported printer. The developers of this app have passed it through an iOS 7 makeover to accompany the refreshed iPhone 5S camera. A few improvements such as, photo frames, putting the special filters and customizable stickers in one location have made it easier to use. Though the app is free, but many effects add-ons ask you to lose your wallet. Some other apps that have been upgraded for iOS 7. The app has enhanced the ability to "add variety" to lyrics display, stations list, and an all-around more informative display on the larger screen. Now, you can share your music and favorite stations through Facebook and Twitter using Social Feature. Vimeo's undergone into complete overhaul. Now, the app looks better than ever. The app allows you to watch videos in your "Watch Later" and "My Videos" list even while offline, a first for the app. Now, this upgraded app also supports video sharing with other iOS 7 users through AirDrop. It also hides some interesting functional changes. Even after its OS 7 refresh, it looks similar. Simplenote drops the blue, bubbly style of early iOS in favor of an open design with big, thin text. The developers have done a complete redesign of this app. It is brighter, cleaner, and more easy to use now. The app has now a more cleaner navigation bars and simple, new buttons. You will not find much improvement in this app. However, Its navigation bars have been brightened & flattened, and its icons are simplified all across the app. Facebook was very fast in upgrading their app for iOS 7. The app has now a new persistent toolbar at the bottom of the main screen with some other notable changes. Except the thin fonts, blurred backgrounds, the semi-transparent slide-out menus, and a change in collections system, most of the things are same in this app. Flipboard remains the same but the few changes. However, the best notable change is, Magazine covers have a parallax effect just like the new iOS home screen does. Digg has been tweaked. It now looks cleaner and can even download new stories in the background. Chrome has also not seen much change, but the app has now some cleaner typography and iOS 7-friendly icons.